Over the past 7 years our office has received many, many calls from investors who believe they are poised to receive a major cash windfall. 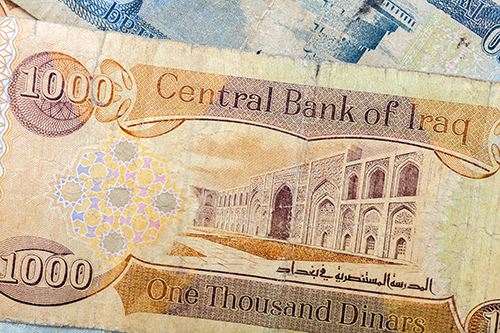 These investors have chosen to speculate on a possible re-valuation of the Iraqi Dinar. Although a great deal has been written about this type of unique investment opportunity as being just another scam. While I typically do not comment on my clients investments, I will say that this has all the markers of a well-organized investment scam. I personally would not invest and would discourage any significant investment in something so speculative and which has gone on far longer than the time frame in which the promoters have promised an RV (Revaluation). Unfortunately, I would suggest that it is just too good to be true. Nevertheless, I will address some of the questions that come up with this and similar type investments. Whether it’s a currency investment, real estate, stocks, or your business, it’s critical to take steps to protect your assets. There are 2 primary tools. The Asset Management Limited Partnership (AMLP) as the core of the domestic plan, and the The Bridge Trust® as the real offshore protection. With a hard currency investment, where you are actually holding the cash, for asset protection (and tax consequences as we will discuss) the asset should be held in your Limited Partnership. In turn your LP interest may further be held by The Bridge Trust®, which provides for ultimate asset protection. The second biggest reason people call me about when referring to a currency investment is Tax Consequences. The first thing to understand is that as a U.S. Taxpayer we are all taxed on ‘Worldwide Income”. That means even if you made the money on the moon, the U.S. Internal Revenue Service wants a piece of it. That’s the bad news. In other words, you cannot ‘keep the money offshore’ and avoid U.S. taxes – not legally! The good news is that in most cases, if you have put your currency investment into your Limited Partnership, and also held it more than a year, then you are entitled to the most favorable of all the tax rates – long-term capital gains. And this is another reason why you want to set up your LP now, and not wait. It gives you a specific tax return to record your investment, as well as a protected place to put it. Based on the above, my advice to callers basically falls into 2 categories. If you have no substantial assets, except for your currency speculation, then I would be hesitant to recommend you spend any money on legal or accounting structures, and rather wait and see (against the odds) if your investment pays off. While many of those who call feel that this is almost a sure thing, my opinion is that, based on the returns alone, you should consider this a highly speculative investment, and I would definitely not count your chickens before they hatch. The second group are people who do have other substantial investments and assets in addition to Dinar. For those people, I recommend that you do consider establishing your Asset Protection plan now for all your assets. We can consider all of your assets and recommend a plan that’s appropriate for you, as well as one that will serve you best “if” a Dinar investment does pay off. previous post: Asset Protection or Bankruptcy?